The Afterlife is not as advertised. So much for the Pearly Gates, so much for putting your feet up, reincarnation is the order of business--once you've filed the necessary paperwork that is. All returning souls know exactly what to expect. All that is, save one. Denton Smith can recall just two things. His name and that his only memory is that of an oncoming train, viewed from an imminently, unhealthy angle. Adrift in the bureaucratic nightmare of an Afterlife that can hardly cope with the number of souls passing through it, he gains the help of a spirit called Tarquin, a long departed Victorian inventor with friends in high places--in fact, about as high as it's possible to get. Together, they set out to discover what it was in Denton's former life that triggered his loss of memory and why it ended in the way it did; stopping only to uncover the fundamental truth behind our existence--or something like that. 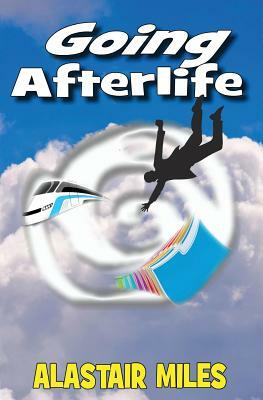 Going Afterlife is a breath of dead air featuring, not one, but two of the biggest names around.